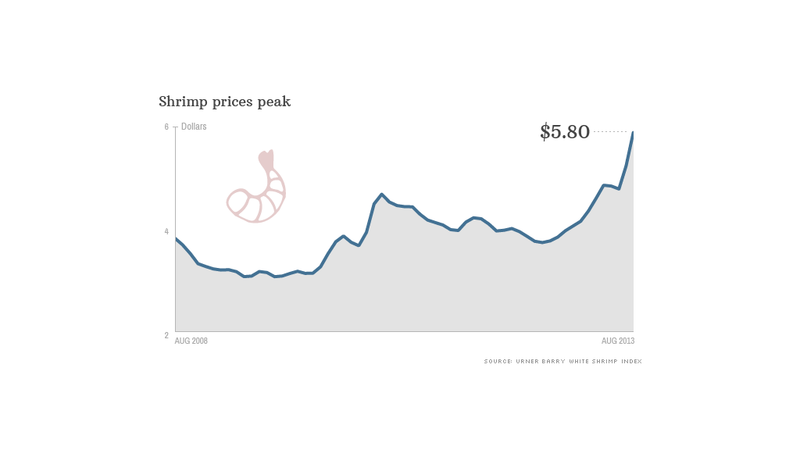 The price of shrimp has experienced a jumbo surge to nearly $6 a pound. That's an all-time high. You may have to skimp on the shrimp this summer. Shrimp prices are skyrocketing to all-time highs, amid a disease that's plaguing the three largest prawn producers: Thailand, China and Vietnam. White shrimp prices are nearing $6 a pound, up 56% from a year ago, according to an Urner Barry index. Interestingly though, the Cadillac of crustaceans is cheaper than it's been in a long time. 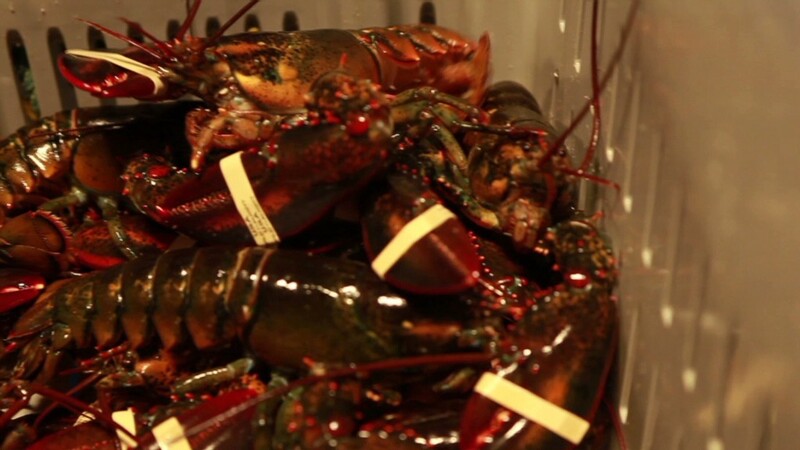 Lobster prices, while still a lot higher than shrimp, have fallen recently. But more about that later. The world is facing an "acute shrimp shortage," the worst of its kind since industrial shrimp farming emerged, say Rabobank analysts in a report aptly named "Shrimp in a crimp." Thailand is the world's largest shrimp producer and has been hit hardest by the disease. The country alone supplies about 30% of the tropical shrimp in the United States and the European Union, and is expected to see its supply cut in half this year. Each year Americans eat an average of four pounds of shrimp per person, but consumption will probably drop in 2013, the Rabobank analysts say. "After a decade of explosive growth, the global farmed shrimp industry has reached a turning point," they said. Back in June, Darden Restaurants (DRI), the parent company of Red Lobster, Olive Garden and other chains, noted higher food costs partly due to "shrimp supply disruptions" could cut into future sales. Seafood alone accounts for about a quarter of Darden's total cost of goods sold, of which shrimp is the most popular protein. And the disease isn't the only thing pushing shrimp prices higher. In other news on the shrimp beat, the Commerce Department ruled Tuesday that China, Ecuador, India, Malaysia and Vietnam have all unfairly subsidized shrimp that's exported to the United States. The ruling could lead the U.S. to enact duties on shrimp from some of those countries, leading to even higher shrimp prices. It was welcomed by shrimpers in the Gulf Coast, who suffered setbacks from the BP oil spill three years ago and now struggle to compete with cheap shrimp farmed in Asia. American suppliers account for less than 10% of the shrimp consumed in the U.S. But back to lobsters. As of August, the average 4 oz. lobster tail cost $13.25, according to Urner Barry. That still costs more than 2 pounds of shrimp, but it's the lowest price in 11 years, as warmer water and fewer predators have led to an abundant supply of lobsters. In fact, over-supply has become such a problem for Maine fisherman, the state recently approved a $2 million campaign to promote their lobsters both in the U.S. and abroad.